Woof! Woof! all fluffy friends and humans big and tiny. Jessie the blog dog here again, today’s blog post is special one because I bring news of another new family member. Also I have pawed and tapped out a special short tale to go with my post today. I’m as good as Smokey me thinks. I better get on with it before I need to hide from the huge scary fireworks again. Once upon a blogging Thursday night, where the fireworks blasted through the dark sky creating magical lights flashing through-out the entire house. Jessie (that’s me) ran like the wind up the huge stairs and found a magic crystal ball, that Smokey had told her grunted magic wishes on fireworks night. Jessie slowly pulled the ball from its pretty base and carried it in her mouth back down the stairs. She tiptoed into the living room and slowly did a walk of the room. Jessie found that she could hear everyone’s thoughts as she passed them. Jessie went to Holly who was watching her with mild curiosity. ‘Holly can you, use your wand on the humans, so they all think of one wish for Imogen?’ Holly nodded and as a firework split the air she meowed loudly, a sprinkle of glitter covered everyone even Smokey who sneezed wildly. Jessie passed Smokey, as she did so with the crystal ball she heard him meow. ‘I wish Imogen love cats especially me, can’t hurt to get in good before she learns to pull tail’ Jessie shook her head at him as the crystal ball glowed red and then went clear again. As she passed her favourite friend human she stopped and listened. ‘I wish Imogen, inner beauty and sweetness to all things’ the crystal ball floated out of Jessie’s mouth, like a toy that had been thrown too hard and glowed so many pretty colours, until it landed in the hands of the most beautiful pink winged fairy called Blossom, she fluttered over to baby Imogen and shook the ball until all little blue and pink butterflies fluttered about her head and whispered all the wishes, until there were not one left. The butterflies followed Blossom as she floated towards Jessie. ‘Oh doggie, your little charge is very blessed, now you put this ball back, remember I’m never too far from your wishes,’ Jessie nodded as she caught the ball and watched as Blossom and her butterflies disappeared in a stream of glittering lights. Jessie walked over to Imogen proud she had done her part to be sure the little girl would grow up to become everything she was surely meant to be. After placing the ball back in its place. Jessie hid under her comfort blanket and blogged about her magical night. 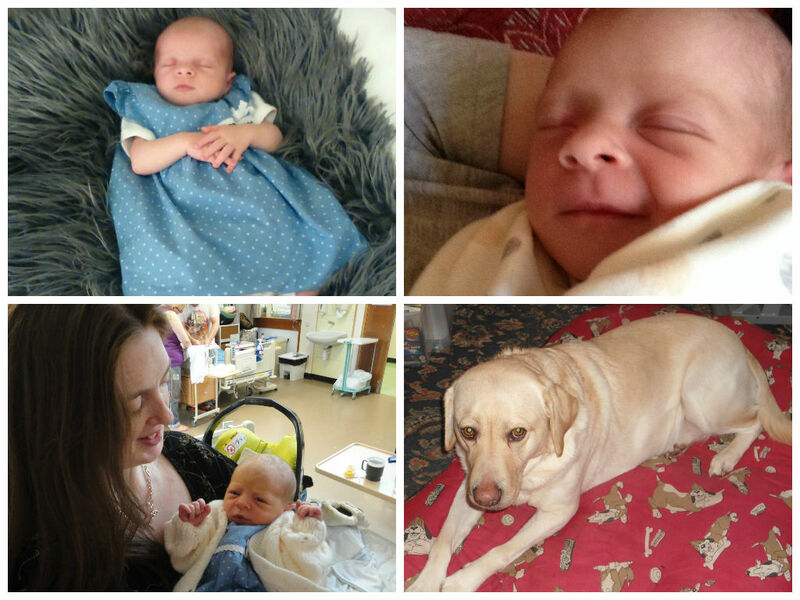 What a lovely post and with the great video of you and your family with baby Imogen! She is adorable. Sorry the fireworks was scary for Jessie. Izzy was feeling worried as well. Luckily bad weather has meant it was just one night, whereas normally it can go on for days and days. Jessie has been well scared tonight, she hate them fireworks. Even with the weather they are still going off tonight. Awwww bless Izzy, Jessie send her cuddles. I’m glad the weather meant up your way they were only going off one night. I think they will still be going off Saturday night over here. I hope you and Izzy have a lovely weekend. Thanks Hun, she is a real little cutie. 🙂 I’m with Jessie too hate them… I don’t even like displays because when I was little I went to one with my family was on-top of one of their shoulders and a firework went wrong set the woman who was only a few feet in front of me on fire. Shows how dangerous they can be. Jessie hate them so much bless her she gets scared to leave the house even in the day for a while. We have to convince her its safe to go out in the garden. I agree the further away from the animal who are hiding under their comfort blankets the better. I’m sorry to hear the fireworks have been scaring Jessie, Our cats weren’t too pleased with them either. Thanks Hun, she is adorable in the pumpkin. 🙂 Yeah Jessie not been a happy dog with the fireworks. I’m sorry Othello and Cleo haven’t been happy about the fireworks either bless them. Imogen is really beautiful and I’m sure she’ll love cats just as I did when I got a bit of cat exposure as a baby lol. I hope you’re well hunni.